Thanks for visiting Oven Cleaning Chellaston Derby for professional cleaning of ovens in the Derbyshire area. Derby Oven Cleaning are a family run oven cleaning company covering the Derby area including Oakwood, Chaddeston, Spondon, Oakbrook, Borrowash, Draycott, Breaston, Risley, Ripley, Elvaston, Thulston, Shardlow, Alvaston, Chellaston, Sinfin Littleover, Mickleover, Heatherton Village, Markeaton, Mackworth, Darley Abbey, Allestree, Little Eaton, Duffield, Belper, Burton on Trent, Castle Donnington, Kirk Langley, Ilkeston, West Hallam, Burnaston, Breadsall, Willington. Our oven cleaning service uses specially developed equipment and cleaning products that ensure first class results every time. These include a custom built van mounted heated tank, where all removable parts of the oven are cleaned. No caustic chemicals are used in the cleaning process. We only use biodegradable products, specifically developed for the process, that are 100% safe with no fumes or odours, and your oven is ready to use as soon as we finish. Call 07760 281510 for prices and information or contact us online. 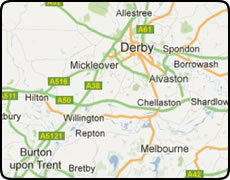 Why Choose Derby Oven Cleaning For Oven Cleaning in Chellaston Derby? Our oven cleaning prices are are always competitive and offer great value for money. Give us a call on 07760 281510 and we will have your Oven looking as good as new in no time. As a family run business we pride ourselves on offering a reliable, affordable and fully insured oven cleaning service across the Derby area including Oakwood, Chaddeston, Spondon, Oakbrook, Borrowash, Draycott, Breaston, Risley, Ripley, Elvaston, Thulston, Shardlow, Alvaston, Chellaston, Sinfin Littleover, Mickleover, Heatherton Village, Markeaton, Mackworth, Darley Abbey, Allestree, Little Eaton, Duffield, Belper, Burton on Trent, Castle Donnington, Kirk Langley, Ilkeston, West Hallam, Burnaston, Breadsall, Willington. If you need reliable oven cleaners for your kitchen oven cleaning then call Derby Oven Cleaning on 07760 281510 for prices and information or contact us online. You can be assured that our oven cleaning service will be of the highest quality, carried out by a reliable competent, honest oven cleaner. Our oven cleaning service covers the Derbyshire area including Oakwood, Chaddeston, Spondon, Oakbrook, Borrowash, Draycott, Breaston, Risley, Ripley, Elvaston, Thulston, Shardlow, Alvaston, Chellaston, Sinfin Littleover, Mickleover, Heatherton Village, Markeaton, Mackworth, Darley Abbey, Allestree, Little Eaton, Duffield, Belper, Burton on Trent, Castle Donnington, Kirk Langley, Ilkeston, West Hallam, Burnaston, Breadsall, Willington. Get a oven cleaning quote or call 07760 281510 for an instant oven cleaning quote. If you are looking for professional, fully insured and reliable oven cleaners in the Derby area contact Derby Oven Cleaning oven cleaning Chellaston today!